On today’s show we have Wool Exploration with the Gotland breed. There are two reviews; The Adventures in Yarn notebook, from Popcorn & Crocodiles, and Whistlebare’s new Cheviot Blue yarn. 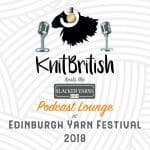 I also chat about the KB100DECK and I may just have some Podcast Lounge and Edinburgh Yarn Fest chat! Welcome chums and thank you so much for all of your 100th episode wishes and congrats – it means such a lot. Later in the show we’ll have a few soundclips from the 100th ep celebrations in Edinburgh, but I wanted to just say thanks again if you had your own KB100DECK , or attended Bath, York, London or the Edinburgh DECKs – that was a really special day. This month we have been exploring Gotland wool an what a great voyage of discovery it has been! The term Gotland – as far as sheep goes – refers to a breed from Sweden which was developed in the 20th Century from the primitive landrace breed, the Gute. The horned Gute sheep belong to the North Atlantic Short tail group, as do the Gotland breed. The Gute almost died out in the 20th C but conservation efforts have helped keep the breed going. Developed from the Gute and also Russian breeds, we get the Gotland. 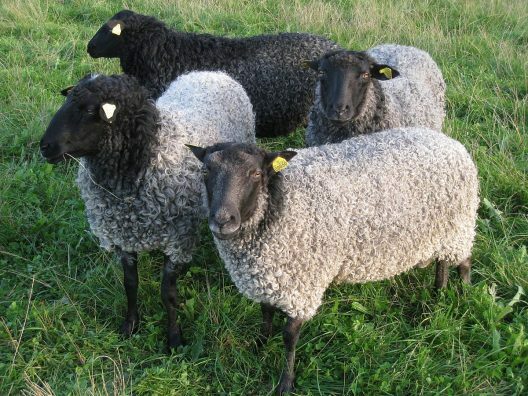 From pale silver, to charcoal grey and always with those dense curls, the fleece of these little sheep (55-70kg) is similar to longwool and mohair in its characteristics. Gotlands became one of our long term lodger breeds, here in the UK, from the 1970s. Sue Blacker calls the Gotlands (a breed which she keeps herself) a 3 crop sheep as their fleece, meat and skins are well prized. The different strains of the Gotland, which have been developed over the years, have different fleece characteristic and the New Zealand Gotlands are said to have very fine fleece indeed. In general, fleeces can be as low as 17 microns and upwards of 35 microns and while the sheep can provide us with all the shades of grey we could desire, Gotland fleece takes dye exceptionally well. We have Elizabeth/Atlasphere to thank for creating our Wool Exploration google form, which has handily collated all of our fieldnotes. You can essentially copy and paste your notes from ravelry into it. We will be using it for all wool reviews from now on. The link is here. I plan on creating lovely notes here for the reviews, but my mind is SO over occupied with EYF at the moment, so you will forgive my encapsulation for the show notes purposes. I do go into detail of who said what in the show. Lovely soft and airy. Feels rustic in my hands. Dreamy fluffy. Thin for a DK, but is silky smooth running through my fingers. Felt like it had air injected. Just a little bit of ‘skritch’. Very spongy & elastic. This is a strong yarn. If you tug on it, it produces a sound and refuses to break. Smooth and squashy. Crunchy and grippy – maybe colourwork. Definitely for clothing – jumpers or cardigans as well as accessories. Would look great for cables because of the lustre. This is producing a dense, warm piece of stranded colourwork with a slight shine and halo to its surface. The yarn was comfortable to the hand, and was easily manipulated for both knit and crochet stitches. Knitting in garter stitch gives it a solid squish. During knitting the wool feels a bit softer in my hands. Neither scratchy nor soft. It’s sheepy! Took cables well. No splitting or pilling as I knitted. Good stitch definition and an even fabric in garter, stocking stitch, moss stitch, cables and simple lace. It also had a lovely drape. Soft and drapey, better definition. Wore this under my bra strap for a day. Most of the day, I did not even realize it was there. Feels softer and smoother on the surface, retaining a slight gleam. Pleased with how the colourwork has blended. Stitches have pleasantly ‘gelled’ together. Wearing next to the skin is comfortable. Exudes warmth. Lace opened up. Felt scratchy when worn on shoulder but not on hip. Cables seemed flat. There is a very light halo of those longer fibres. Feels a bit ‘wiry’, with a visible halo, but comfortable to the touch. Test two was similar to test 1. I didn’t notice any piling after distressing it, It kept its dimensions. Cables held up well. Slight sheen and fuzzy halo developing which could lead to pilling in time. It feels slightly softer with every wash and the halo is definitely more pronounced – no piling as such, but extra halo. Washed in machine on 30 degrees with ecover and 800 rpm spin. swatch looks just the same and has held the block really well. Worn swatch is incredibly warm, would make insulating items. May get softer and more haloed over time. Sweaters, outwear, some accessories, haps. Textured stitches,stranded colourwork items, lace and cables. Patterns mentioned: Log Cabin Blanket, Polygon blanket, Earl Grey Martini shawl, Polgooth socks, Windswept jumper, Scollay Cardigan. Two of us hand-spun – I spun from shearling Gotland batts from Eden Gotland, purchased at Scottish Smallholders (no online sales). Sandra used roving from Winghams and made a robust 2ply DK weight. I found the Gotland just kept on drawing and the twist was delicious. I think I spun my skinniest singles to date on my Bliss and really pleased with the finished skein. We are currently amid our exploration of Ryeland and there is a chatter thread over in our ravelry group. There will be a wee cross over with this and our next breed Jacobs. This is due to the fact that some of you have said you wish to get your Ryeland at EYF. Your deadline is 23rd March. Next we are looking at Jacobs and there will be a post soon on that. I’m delighted to announce our next selection of breeds, which are Teeswater, Romney, Dorset and Southdown. Please expect a post on the spring/summer exploration soon and those deadlines. This is the halfway point in the episode. Feel free to pause and take a break. I was utterly thrilled when Emily Owen got in touch with me recently to tell me about her new notebook for yarn lovers. I was even more delighted when she offered me one to play with! I was so keen to see the notebook, Adventures in Yarn, and boy, oh, boy! I was not disappointed. This is a beautiful BIG notebook, 21cm x 15cm, with an oversized and – more importantly – a sturdy spiral binding. The hardback covers are great too, and I really love the simple but really effective cover design. Inside the book I squee-ed with delight at the colour wheel AND incredible needle gauge pages, and then first of 7 plastic pockets – like a good novel, this book was starting off really strong – a real page-turner! There are 5 sections of different coloured pages, with lined, plain and squared sheets, the paper quality is really great, must be about 200gsm. Following each different coloured section there is a yarn notes segment, where you can keep swatches of yarn and a few notes about them…HELLO WOOL EXPLORERS, ARE YOU HEARING THIS? This is so much more than a notebook; there are also monthly to-do lists and a yarn inventory segment (though I may need more than 4 pages for this) and a really super achievements segment. I love the designs on the pages and the whole design aesthetic of the book. I may have had the monthly to-do list at the front of the book, or a wee tab so that it is easily flicked too, but that is my only piece of critical feedback. Adventures in Yarn is a great paper and ink space that you will love filling with your knitting thoughts, perhaps for your design work, your wool adventuring and your good intentions. The book cost £18 from the etsy shop. 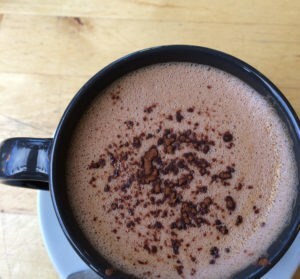 I think you will love it. Thanks to Emily for letting me play with this amazing book AND she has also given us one as a prize. Head on over to the Raverly group to find out how it could be yours! Advance tickets for EYF Marketplace days have sold out, but do remember that you can queue to get tickets on the door on the Friday & Saturday (16th – 17th March). There are also several extra events happening, which you need to have tickets for, or have registered for. Do check out the EYF website for these, in particular, on the Wednesday (14th) and Thursday (15th) there are additional knit and meets at AKVA and Hemma. There are also a few tickets left for the Meet the Shepherdess event on the Sunday. I am thrilled about this event, as I wrote on the blog last week. As well as having a marketplace with 8 new vendors, the focus is on small wool businesses! Its also your fond farewell to the fest for 2018, so don’t rest on your laurels if you fancy going. Tickets are £7 and must be purchased in advance. At the Blacker Yarn Podcast Lounge this year we will have our Meet the Podcaster event from 12-2 (we made this longer cos you asked us to! ); there is the BlackerPodKAL meet up on the Friday from 3-4pm too. In terms of events i am delighted to say that we will have ‘The Listening Pod-ject” where you can share your woolly conversations with us for the KB podcast. We often have incredible conversations at events like EYF. 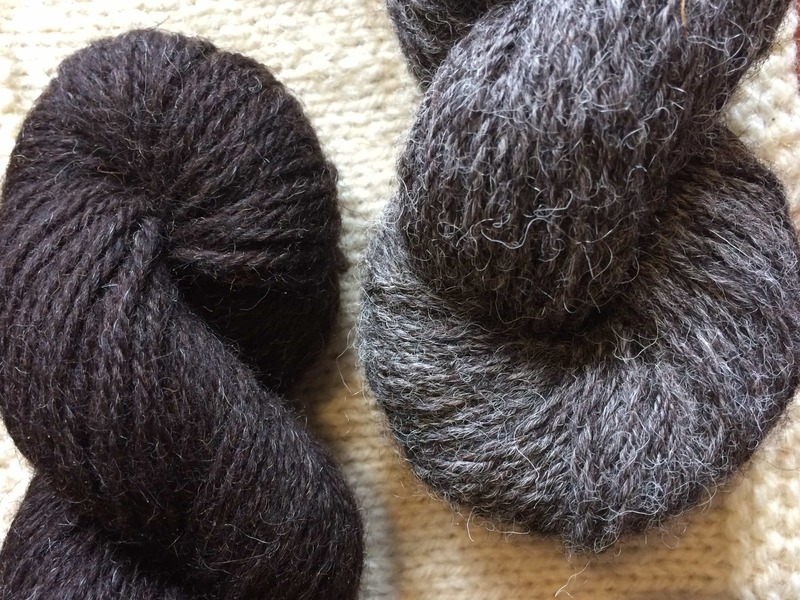 We go there with dear woolly pals, or we meet people there that perhaps we have only known online – together we get into chats about our favourite wools, designs, podcasts…but we also share more deeply on our connections to these. There is much more happening in the Podcast lounge over the weekend and I will talk more about it next time too. I know all of you listening can’t make it to EYF, but we will endeavor to make you feel part of the action in some way here on the podcast. You can register your interest in attending here. 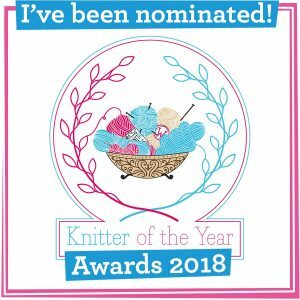 Alice Elsworth is not unfamiliar to KB friends, she has the phenomenal Whistlebare yarns, which are made from her own flocks of angora goats and wensleydale sheep. Recently Alice sent me parcels of squashy goodness which contained her new yarn Cheviot Blue – a 60% Cheviot shearling and 40% BFL yarn. Much of this yarn was for prizes for the KB100DECK, but she also sent me a review skein and two mini skeins for some listener reviewers! 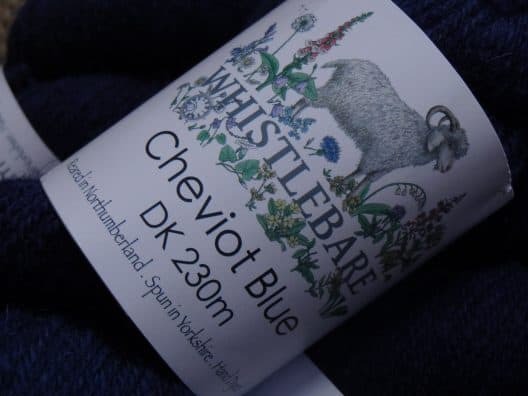 Cheviot Blue Faced Leicester is woollen spun to produce a yarn that is bouncy and crisp. It is really full of squash. This is what Alice had to say about their new yarn. The colour definitely was what struck me, along with that beautiful dry handle and the squashiness of the skein. I popped some of this lovely 4ply yarn in the post to two listener reviewers – LadyGraye aka Tracey and BeccaBadger aka Rebecca. This is what they had to say. Rebecca: In the skein the yarn is plump and squishy with character. It isn’t spun particularly tightly but isn’t so loose as to be splitty. Tracey: The skein smelt deliciously sheepy and felt strong and dependable. Almost string like with a softer touch. 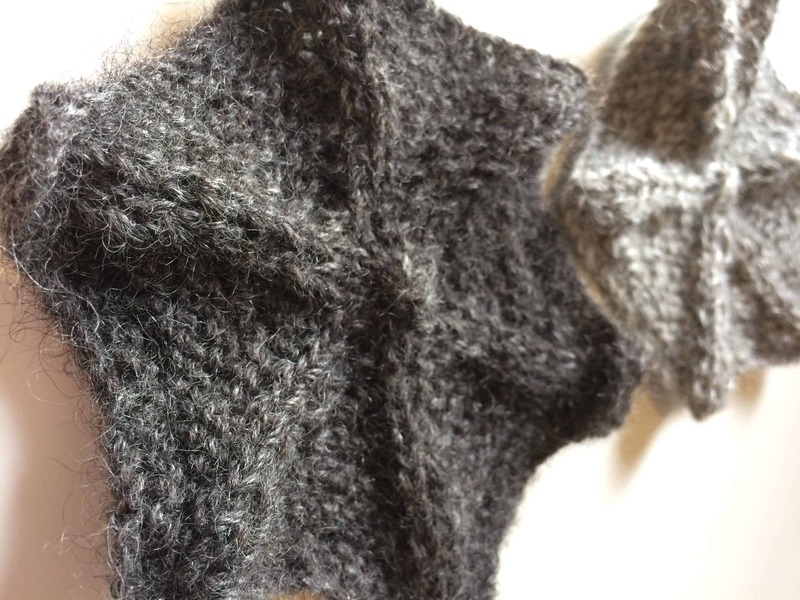 Rebecca: I used stockinette with some lace and cabling, surrounded by a garter stitch border. I used 40 stitches and 60 rows. It was 14cm x 16cm unblocked. The yarn had great stitch definition, looking good in both cables and lace. I should have perhaps used slightly smaller needles, but even with the larger than ideal gauge the stitches were fairly even. The yarn didn’t split at all during knitting and it was a pleasure to use. I did notice that when I was knitting from the ball the yarn did like to stick to itself, so at this point I imagined the wool would felt fairly easily. Tracey: Whilst knitting a soft halo of hairs developed and I did come across the very occasional stiff guard hair that easily pulled out with my fingers. This doesn’t bother me as I feel that it reflects the genuine provenance of the yarn. The swatch had a nice stitch definition and a durable quality to it when completed and it measured 6” x 6”. Rebecca: I gently washed the swatch in plain warm water and blocked it to 20cm x 18.5cm. Once it was dry and unpinned the swatch remained this size. I wore the swatch inside my sleeve (of a Jacob cardigan) on a trip into town. I didn’t notice any itching, in fact the only reason I noticed it was because that part of my arm was nice and warm! There wasn’t any noticeable felting. Once I got home I moved the swatch to my leg, which again didn’t cause any problems. I decided to try it on my back as this seems to be where I’m most sensitive to fabrics. It did itch a little and I had to remove it. Tracey: Popped into the waist band of my jeans so that the swatch was actually against my abdomen. Worn all day whilst enjoying a day around Whitby. As with many wools of this origin, there was an initial prickle but I soon forgot it was even there. At the end of the wear test , I felt that the swatch had generally softened and although the stitch definition is still present, there is a lovely settling in of the stitches and the swatch has bloomed into a beautiful strong fabric. Rebecca: For the second wash I put it straight into hand hot soapy (normal supermarket delicate detergent) water, folded it in half, and scrubbed. I did that for a few minutes, then rinsed it in very cold water. I rang it out rather viciously and left it flat to dry. The swatch was now 17cm x 16cm. Surprisingly, although there is obviously some felting, the stitch definition is still fairly good and I actually rather like the look. The rough treatment has softened up the yarn wonderfully, and I could just about tolerate it on my back with only minor irritation. I think a third wash would make it even softer. Rebecca: I think this wool is a definite candidate for not judging by first impressions as it softens up so much during washing. I think it would make fantastic cardigans/jumpers, hats, gloves, and even shawls/scarves. I would love to try the yarn in a colourwork pattern. I think anyone with particularly sensitive skin should be a little careful with what they use this yarn for, but I think it’s a great all rounder. The only thing I wouldn’t recommend for this yarn is socks as it’s fairly loosely spun. You can hear my own review by listening in (these shownotes are long enough) – I think this is going to be great for colourwork and for really incredibly warm knits. Cheviot is a wonderful breed wool and when mixed with a magical fibre like BFL its a bit of a treasure! I bought a SQ! Available in DK and 4ply from Whistlebare.com the yarn cost £16 per skein and mini skeins in both weights cost £4 – perfect for colourwork or stripes – I can imagine an Ursula cardigan, by Kate Davies or a Burrafirth sweater by Gudrun Johnson. Thanks to Alice for letting us all test drive this delightful yarn – a real heritage wool for items that will last and last! The show plays out today with a few soundbites from the KB100DECK in Edinburgh (there are a few more for another day!) but I wanted to tell you that I have one wee project bag from the DECK to give away! Inside the bag is a great wee laser print badge from The Knitting Goddess (she also printed the bag) a little discount from Meadow Yarn and some other things, but there is the addition of a special skein from Uist Wool. This is a skein of Cairnis, which is a Zwartbles Ryeland blend and is the last of its kind. I will have some more UW news next time, but thanks to them for such a lovely extra prize! There is also a secondary prize of a handmade darning needle case from Ericka Eckles , which had been a door prize on the day but fell off the table! We will find it a loving home. Jump to the Rav group to enter and be quick, this giveaway has a shorter duration as usual! Music: Carefree by Kevin McLeod and Singin’ in The Rain (demo) by David Mumford – Both are on FreeMusicArchive and are both shared under Creative Commons Attribution license. Images are copyright to those attributed in the caption or in the accompanying information, otherwise they are mine. The Popcorn & Crocodiles book Adventures in Yarn and the Cheviot Blue yarn from Whistlebare were given to me for free in exchange for a frank review. I will always offer my honest opinion whether given items or buying items for a review. Items mentioned in the KB goodie bag are freely donated by those companies mentioned and linked in the shownotes. *The Listening Podject info – Recordings will be used on KB throughout the year. on the podcast, website and/or social media. You can remain anonymous! 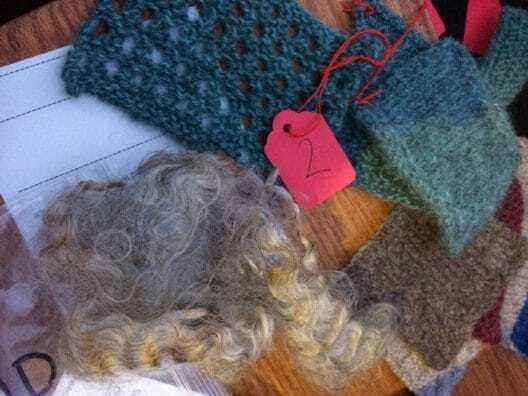 Thank you for another fascinating episode, Louise, and for running and co-ordinating the Wool Explorations as well as the detailed reviews of new wool blends with other woolly muckers. Please, please don’t feel you have to apologise for the length of the episodes. Your podcasts always contain such meaty information. As you don’t waffle to pad out shows and pace the show with different segments, I really don’t mind it if episodes are a little longer. And your detailed notes make it easy to work out where is a good spot to break off, if necessary. Another great episode, Louise. I’m really enjoying listening to the Wool Exploration reviews. Longer episodes are no problem, in fact I’ve listenend to this one in three parts due to various interruptions! As always, a super show Louise! I prefer audio to visual podcasts and yours is the best one out there. Always interesting, never boring. Some knitting podcasts are too wandering and random. 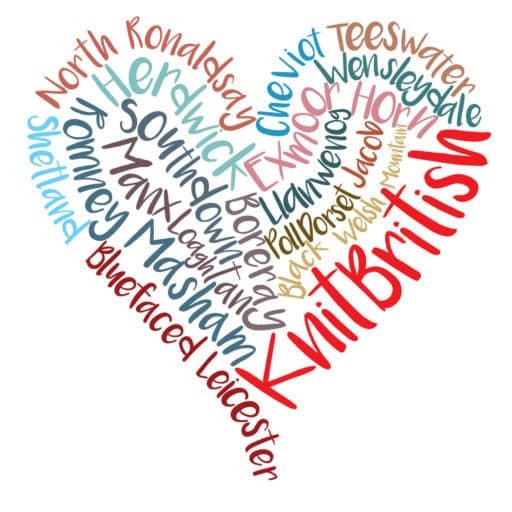 With Knit British you can always be guaranteed an enjoyable show, with lots to learn and a serious amount of enabling! I’m unable to get to Edinburgh Yarn Festival, but know I can get second best by listening to your post-show podcast. Thank you for all the time and effort you put into both your podcast and show notes.